Alternative hair has become so popular, it is almost mainstream right now. 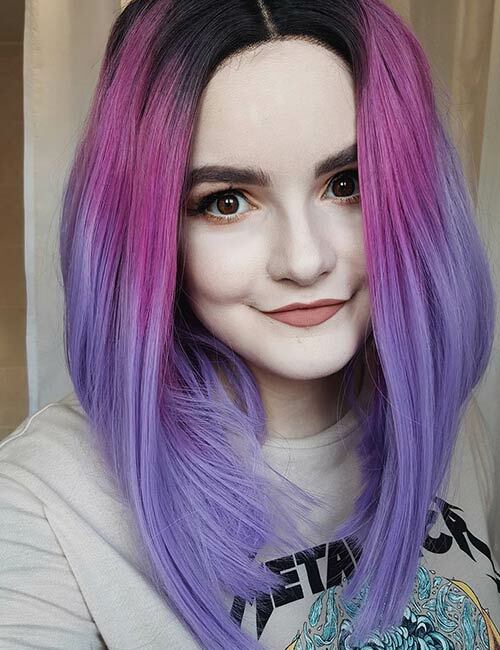 Purple hair, especially, has become one of the biggest trends in the scene. 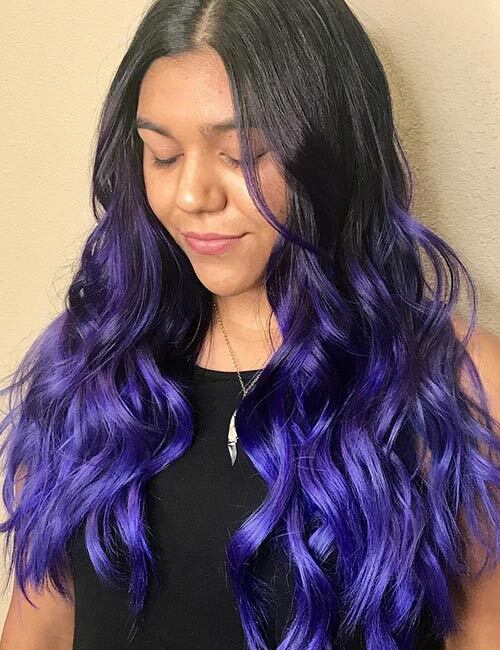 With different shades of lilac, lavender, plum, and violet to choose from, there is something for everyone when it comes to this versatile color. And we’re all for the purple hair don’t care movement, especially the ombre styles. 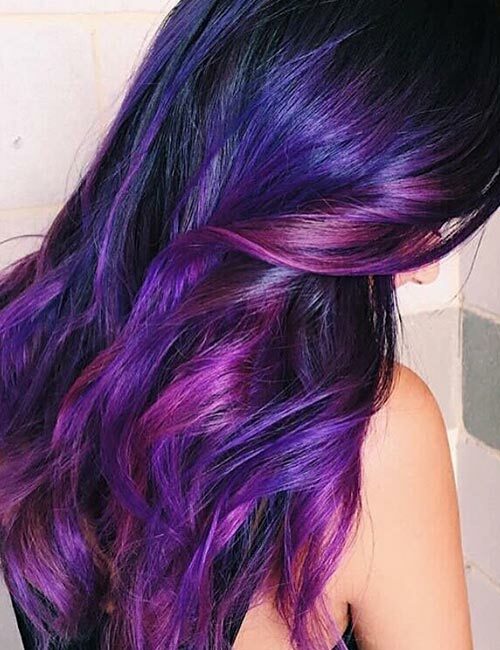 Here, we’ve put together a list of 20 of the best purple ombre styles that we’ve come across. But, before we get into it, let’s talk about how you can achieve this look at home. 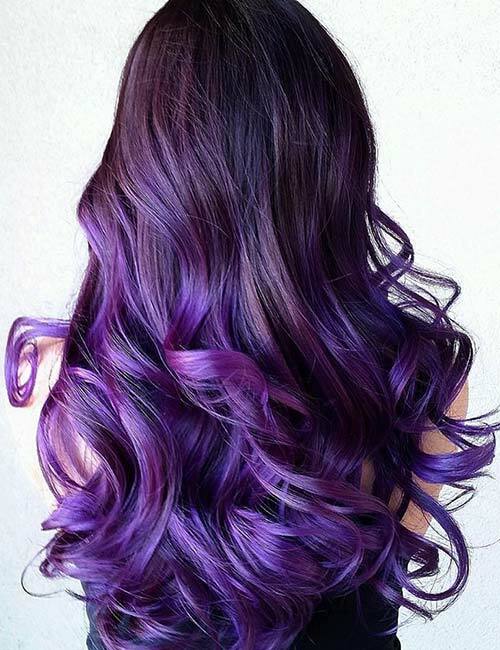 If you have dark hair, you will need to pre-lighten your hair before you can dye it purple. 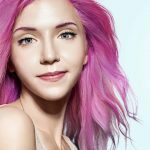 Here’s a step-by-step tutorial that will tell you how to go about bleaching and coloring your hair to achieve the purple ombre look. Ensure that you are working with hair that has not been washed in a couple of days. Brush out any tangles from your hair and clip away the crown section. Put on your old shirt, wear your gloves, and apply the vaseline all along your hairline and also on your ears, neck, and forehead. Following the instructions provided with the bleaching kit, mix the developer and bleach in a plastic bowl. Apply the bleach to the lower layers of your hair. Work in sections to ensure that each strand is covered. Once you are done with the lower layers, undo the crown section and repeat the process with the top layers of your hair. Once all of your hair is covered, run a hairbrush through it to evenly spread the bleach. Wait for the recommended amount of time (which is usually 25-45 minutes). Wash, shampoo, and condition your hair. Note: You might have to repeat the bleaching process a couple of times to achieve the desired lightness. Ensure that you are working with freshly washed and dried hair that has not been conditioned. Starting with the lower layers, apply the fully pigmented dye onto the higher parts of your lightened hair. If you have light hair to begin with, drag the dye down from your roots. As you make your way down, start fading out the purple dye with the diluted color. Once you’re finished with the lower layers, repeat the process with the top layers of your hair. Your work here needs to be meticulous as these are the parts that everyone will notice first. Leave the color on for the recommended amount of time (30 minutes to an hour), and then wash your hair with a color protecting shampoo and conditioner. It might be a good idea to invest in a good purple shampoo and conditioner to maintain your hair’s color for longer. 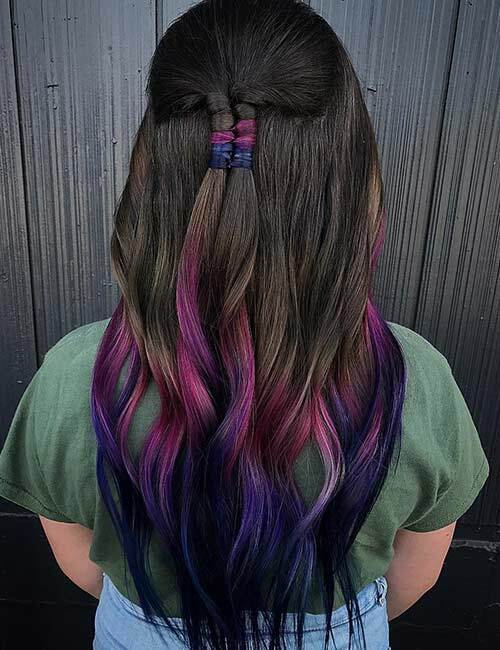 This ombre is a unique blend of colors. The dirty brown locks take on purple tones at the mid-lengths of the style. The purple starts off with subtle pink undertones and quickly picks up strong blue undertones. The result is truly magical. There is no better combination than black and purple and this style has done the duo complete justice. The natural black has been painted with the darkest purple with such proficient blending, it is hard to tell where the purple ends and the black begins. This hairstyle is serious dreams. The cool and rich purple is heavy at the roots and fades out to an ashy lavender. The color transition is so subtle, you don’t even notice it unless you compare the shade at the roots to the tips. Talk about movement. 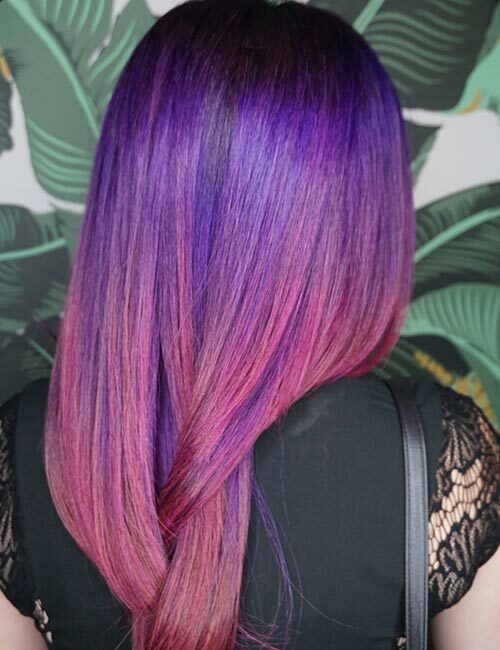 This beautiful ombre starts off with deep eggplant roots that fade to a lavender. 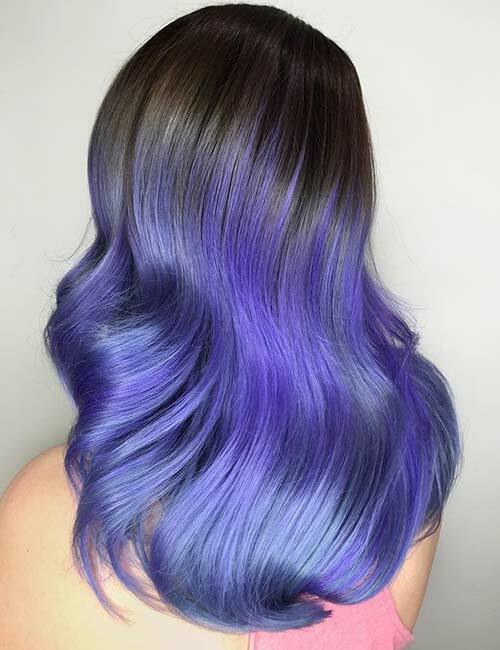 The splash of blue-violet at the mid-lengths help add movement and dimension to the style. If your hair lacks luster, there is no way you can go wrong with this style. These colors are so rich, we can almost taste, smell, and hear them. Not to mention that the blending on this style is true perfection. The natural deep chocolate seamlessly transitions into a berry-plum shade. A style like this is so versatile, it is sure to look great through every season. To say that we are in love with this hairstyle would be a major understatement. The plum base of this style has subtle amethyst undertones. 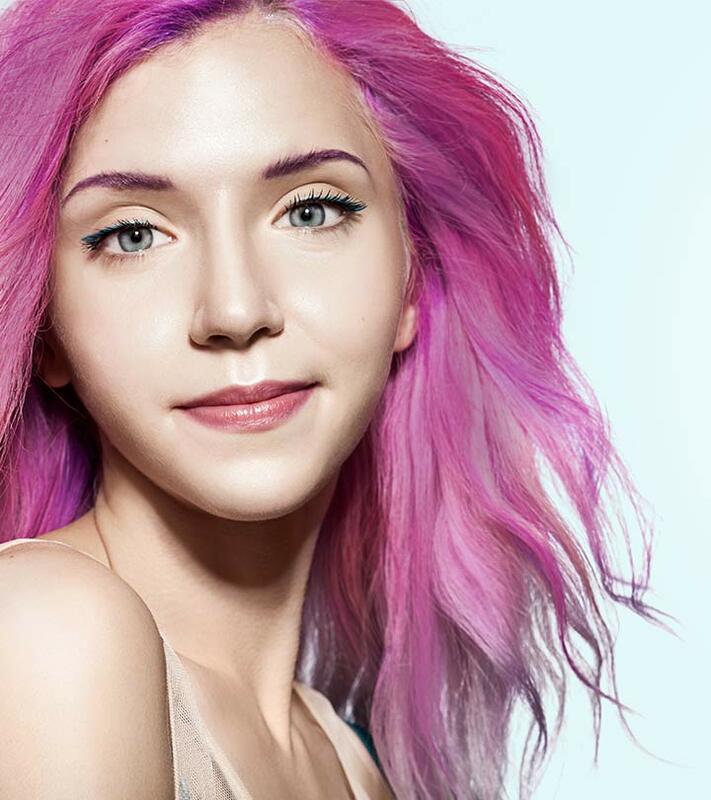 The transition through the mid-lengths takes on stronger but pastel violet tones and the tips end in a beautiful lilac. Braids and colored hair were made for each other. This look incorporates a quick fade at the mid-lengths. The transition starts off with a deep purple that blends the brown and purple-fuschia. This ombre is sure to suit all hair types and textures, as well as all skin tones. This is one of the best and most put-together alternative fashion looks we’ve seen, and it would not be complete without the hair. The gothic block roots fade to a deep purple, which quickly fades out to a soft lilac. 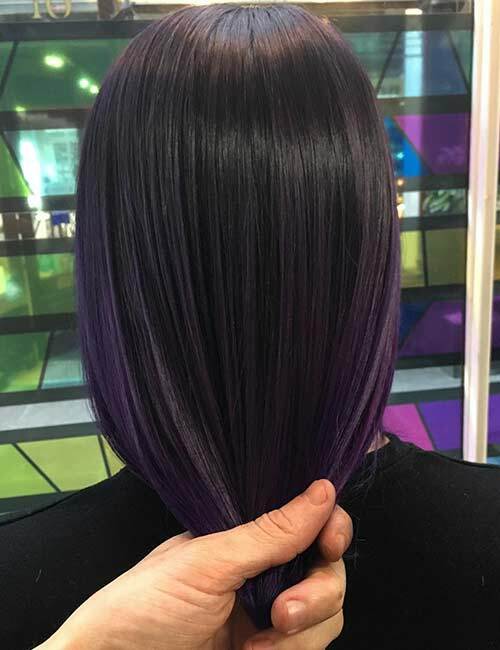 If you’ve been wanting to let out the goth in you, this purple-ombre look might have been tailor-made for you. The ashy tones on this lavender have us swooning. The dark black roots on this style fade to a pigmented lavender that picks up subtle ashy tones as it fades out. The ashy tones add texture and dimension, making this style perfect for people with fine hair. 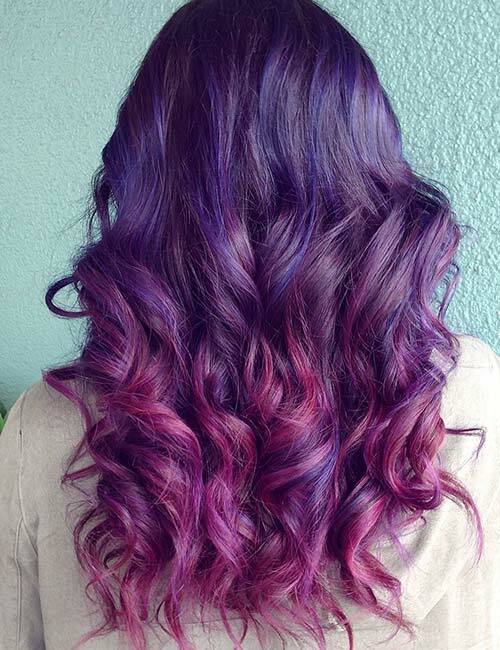 This is definitely the smoothest purple ombre that we’ve laid our eyes on. 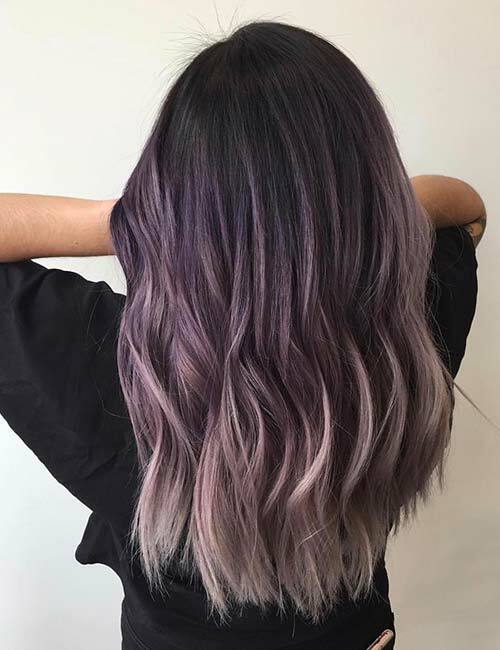 The black roots take on cool tones as it transitions to a gray, and then a beautiful soft violet. The artist seems to have incorporated gray tones to create movement and dimension in this look. You can never go wrong with subtlety. 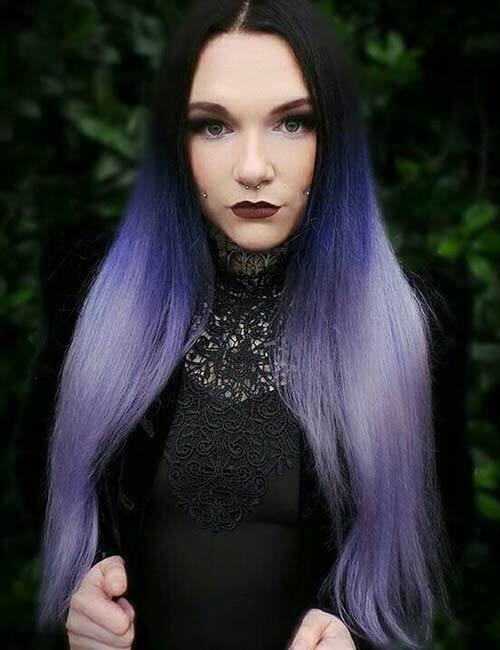 The extended shadow root on this look makes it one of the best purple sombre styles that we’ve come across. 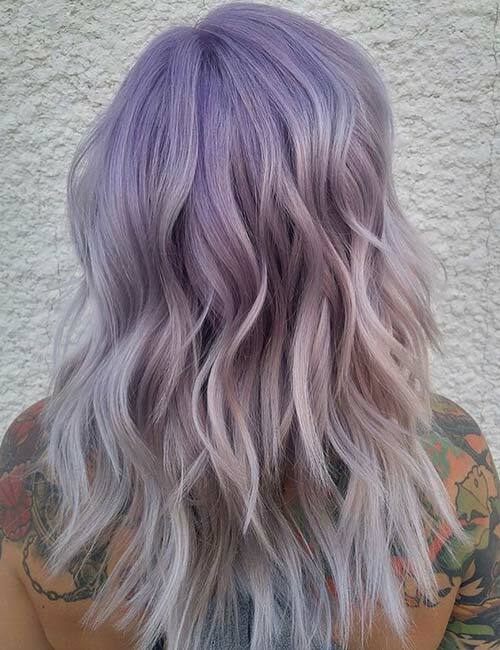 The subtle lilac transitions to a platinum blonde as you shift your gaze from the roots to the tips. 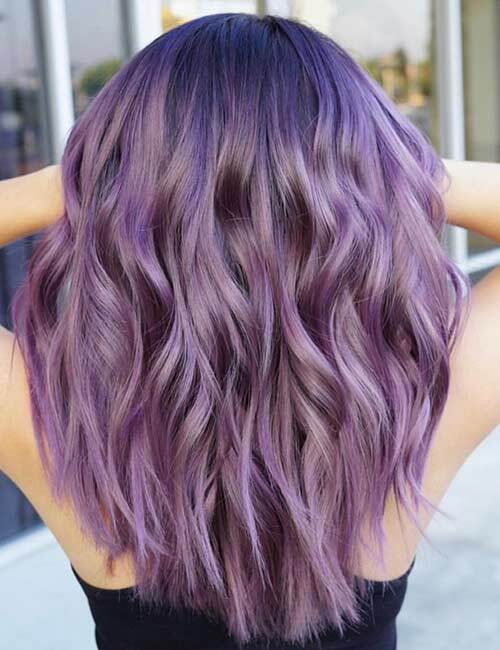 If you love cool tones and want you to keep your hair light, this is the ideal purple ombre hairstyle for you. How does the color of an eggplant manage to look this beautiful? The deep shade seamlessly blends out of the black and into a lighter and more vivid purple. The color is smooth and vibrant, and is sure to suit all hair types and textures. This has to be one of our favorite textured looks. The purple shadow root has gray undertones that fade to silver undertones as the purple fades out. The texture of this style makes it look like a big, beautiful, fluffy cloud. We love the blend of color in this style. While there are two prominent colors that pop, the deep amethyst and fuchsia-purple, the artist has also incorporated shades of deep violet at the crown to add texture and dimension. This style is great for fine and lightly textured hair. 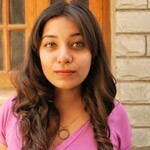 If you don’t want to stray too far from your natural hair color, this might be the style for you. 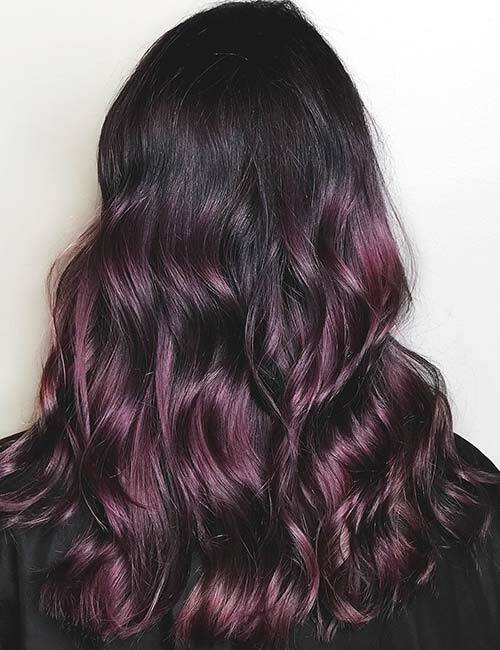 The deep brown roots fade out to take on vibrant plum tones to create a stunning visual. The style is easy to achieve, subtle, and sure to suit all skin tones and hair types. Colors this vivid need to be banned for being too gorgeous to handle. Dark purple roots fade out to a vibrant purple that quickly fades to a lilac at the lower lengths of the hair. 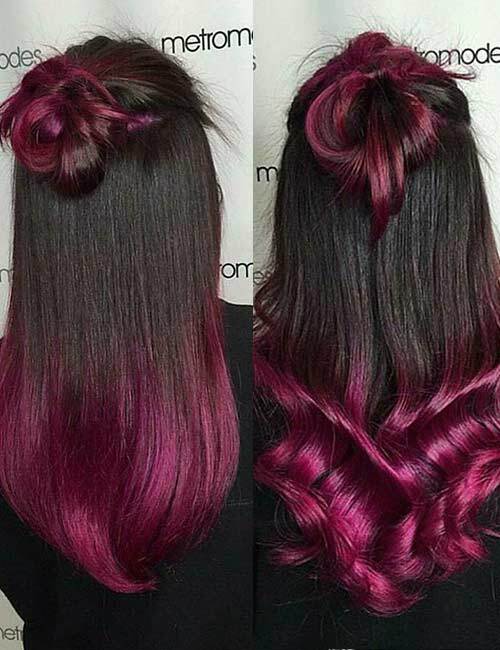 If you like purple hair that pops, you are sure to fall in love with this hairstyle. The sheen on this style though! The natural black roots start to take on deep violet tones at the mid-lengths of the gorgeously long locks. As you move further down the length of the hair, the color shifts to a lighter but more vibrant shade. 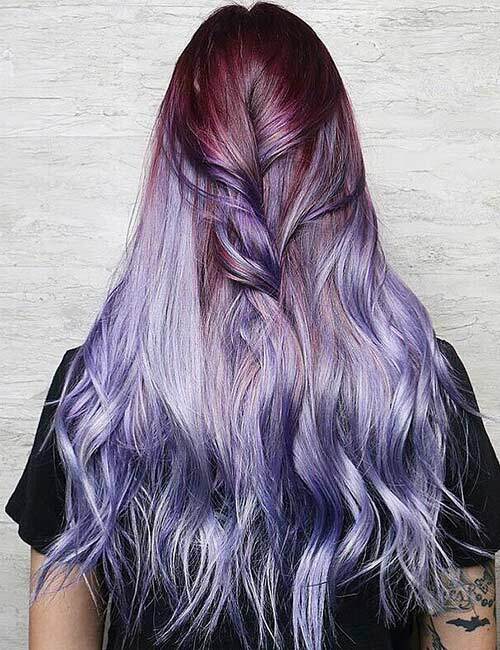 This look is definitely one of our favorite cool-toned purple ombre hairstyles. 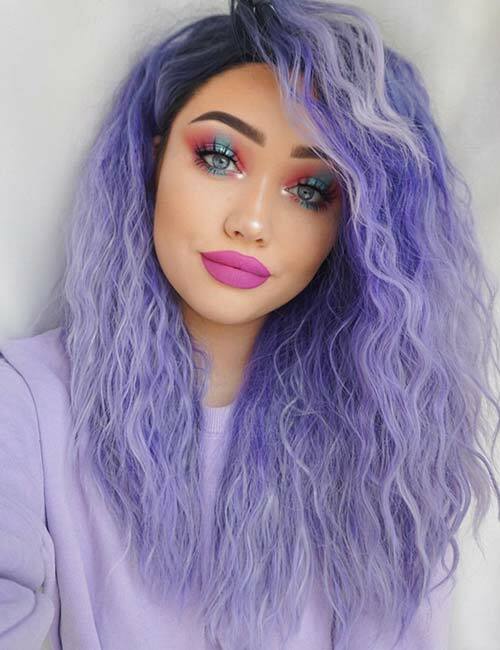 The pastel trend is here to stay, and if you can’t decide whether to get a purple with strong pink undertones or blue ones, this look will let you have the best of both worlds. The deep black roots fade to a pink-toned purple, which then transitions to a beautiful lavender. If this is not what a unicorn’s mane looks like, nothing in the world makes sense to us anymore. 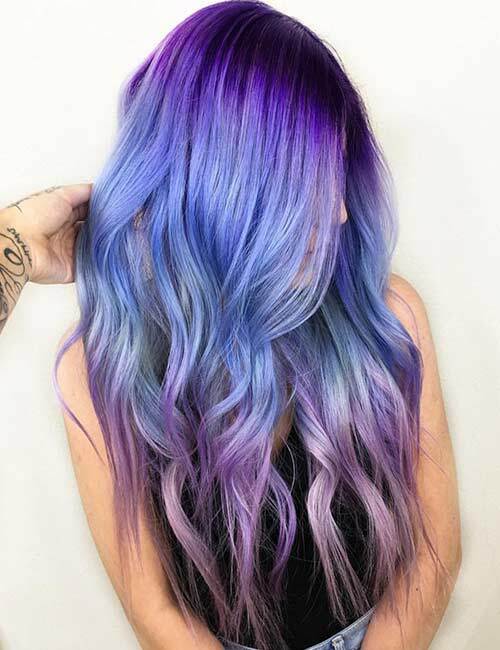 The style starts off with a vibrant purple with blue undertones, which then starts to pick up pink tones towards the tips of the hair. If it would rain in purple, this world would be a much better place. But the world if not perfect, so we’re gonna have to make do with this gorgeous sight instead, and we’re not complaining. The black roots create a shadow-root effect. 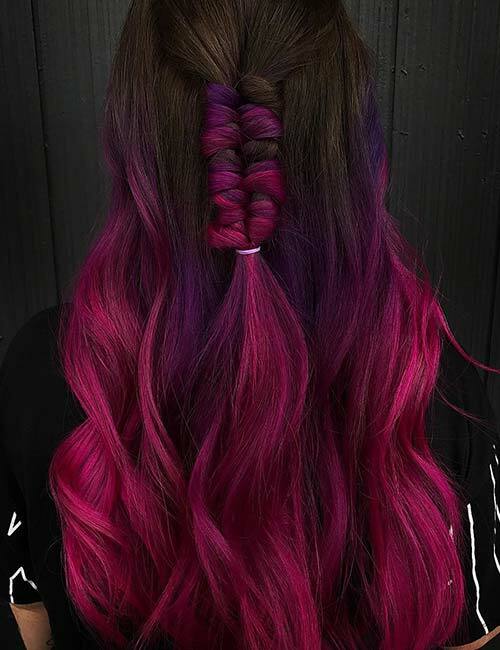 The base then fades to a two-toned purple with heavy blue undertones at the mid-lengths and pink ones near the tips. There’s no way that purple hairstyles could get any better than this. 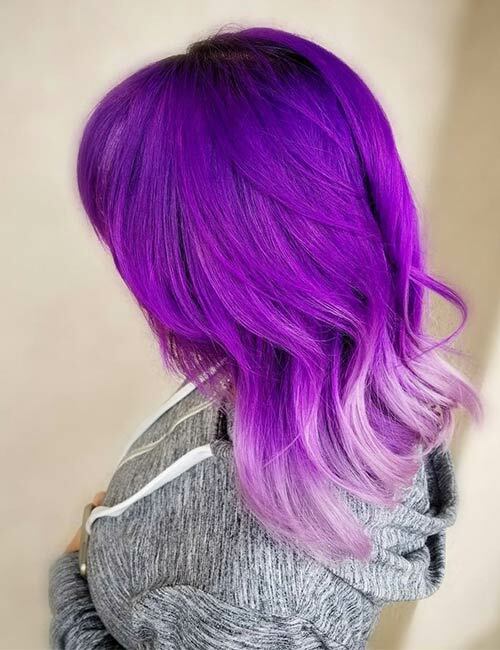 Are you planning on going purple? Which one of these purple ombre styles is your favorite? Let us know in the comments section below.